This model is no longer available. (As of 12/1/2018). Check out the latest Self Balancing Scooters Review article for more options! 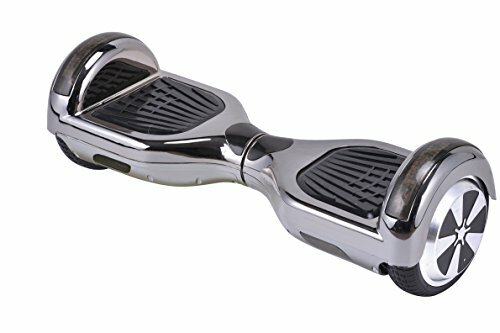 The UL22772 certified hover-board was one of the fastest products to hit the market with a fully safety tested board. It´s something of a mystery as well. There´s no branding on the chrome colored outer-shell. After some digging around I discovered this scooter is made by Yongkang Dinchang Industy & Trade Co (YKDI). They´ve been around since 2013 and produce a range of electric transport vehicles like go-karts and dune buggies. This particular one is called the Smartbalance 6.5 inch. The feature that first grabs your attention is the UL22772 safety certificate. A year ago passing those 159 individual safety battery checks would´ve been impressive. In today´s market every board will have passed the UL22772 testing procedure. It´s a legal requirement in the US. 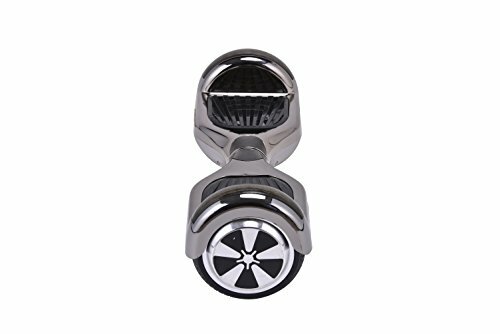 With that in mind, let´s look at some of the other features the Smart balance scooter offers. 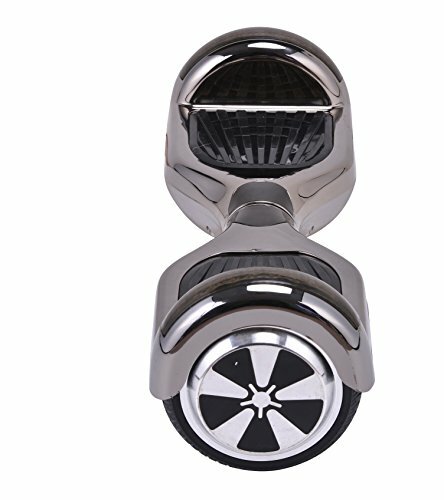 The Smart balance 6.5 inch has dual 350W motors powering its 22llb frame. The controls are simple, responding to the shifting of your weight to dictate speed and direction. It carries a max load of 220llbs, runs up to around 7 mph for about an hour on a single charge. Aside from the Bluetooth speakers, which are exceptionally loud, there really isn´t anything special about this board. All of the features we find here are industry standard. In fact, a lot of the more advanced board manufacturers are doing away with speakers altogether in favor of higher performance. There is one nice addition. Once the battery hits 10%, the board will gradually reduce power until it reaches a standstill. There is one nice addition though. Once the battery hits 10%, the board will gradually reduce power until it reaches a standstill. It doesn´t sound like much, but a common problem with these devices is that once the battery goes the balancing system shuts off sending the rider flying. YKDI have tried to address this issue at least with a good feature that I hope to see on more hoverboards in future. 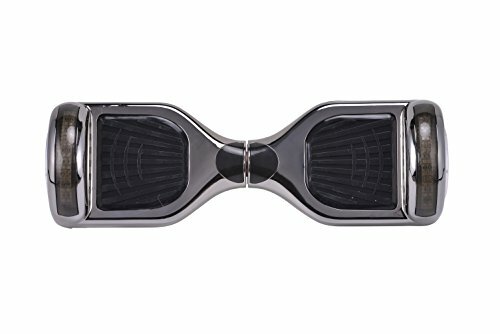 The Smart-balance 6.5 inch hover-board is a budget piece of equipment. The design is really based on imitating rather than innovating although, the price is very good and the performance is ok. For a child, this board should perform well enough without breaking the bank. One problem with manufacturing a standard board in a fast-paced industry is that your products are instantly dated. The wheels, for example, are 6.5 inches high. This results in a low ground clearance which has led many manufacturers to produce larger 8 inch wheels. The problem with a long ground-clearance is that the board scratches a lot, as well as bucking the rider at the first stone, or piece of debris. At this point I have to mention some of the less than convincing confirmed buyer reports about this product. A significant amount of people have reported faulty manufacture on these boards. Whether that comes during the delivery stage or from the factory is unsure. The boards that work are a decent buy, but make sure you get a warranty with each purchase to guard avoid being stuck with a faulty product. The price is probably the Smart balance´s strongest suit. It´s a good $100 cheaper than products that offer equivalent specifications, although shipping costs may be a little bit higher. As far as a basic boards go this one performs well enough. I can´t really see too much issue with it if you´re buying for a child should do fine. I like the slow down system as the battery reaches 10%. It´s a good idea that should become industry standard. Faulty products seem to be fairly common here so make sure that you get a warranty with your purchase. I think, without being too harsh, that this board is a cheap knock-off. It imitates a lot of the features of other boards on the market but there´s nothing here to differentiate it from the pack. Everything seems to have been carried out with price in mind. And, to be fair, they have kept the costs down. As a short-term buy it might be worth it. As an investment, I can´t recommend it. I see this board lasting a year at most.